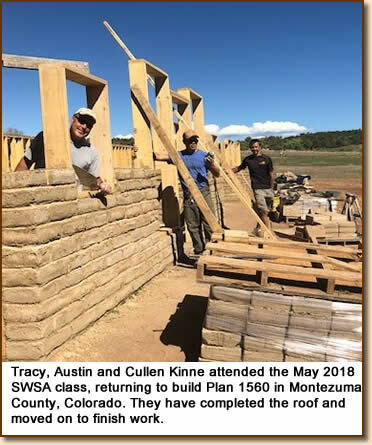 Solar Adobe School - Learn about Adobe Construction, Adobe Home Building, Adobe Bricks, Green Building, Rammed Earth, Pressed Block Construction, Earthen Construction, Adobe Drafting. Quick description: The class is slanted towards owner-builders, designers and those new to Earthen Construction. It is taught in a straightforward, descriptive style using drafted drawings, PowerPoint, Hands-on, show-and-tell and lecture.The class takes place at a rustic site in Socorro County, NM. 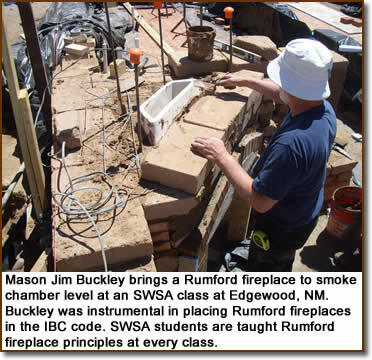 Students work with authentic Adobe/Compressed Earth Block materials and tools. They learn standard earth mixes and cast adobes of different sizes. Larry Elkins of Adobe International visits (see schedule below) with his hydraulic earth block machine and students use their own and on-site mixes to press blocks. They learn stabilization recipes and how to build walls, corners, arches, and door bucks. A 9-page set of plans for a small Solar-adobe home is sent to you digitally before class*. Prepare to heft rustic materials as if on your own project. Specific goals will be defined, for example, building an arch. The class reviews arch instruction inside, then steps outside to build the arch. Photos are encouraged. Materials will be ready, such as lumber, forms, adobes, pressed block, mud mixes, plasters, stabilizers and various tools. Students will study soil materials, blending of materials and the forms used to make adobes. Wall constructions will be to New Mexico code, but with notes about neighboring State codes. Students learn about stacking, cutting and laying block, erecting rough bucks, setting up leads, turning corners, proper overlaps, in-wall reinforcement, setting up electrical circuits and boxes, wall finishing for exposed work and wall prep for insulation, plaster or stucco covers. Being in the country means avoiding the hassles of big city traffic in Albuquerque. Belén, a small town with motels/restaurants, is 8 miles north on I-25. At the country site, our only noise pollution is the occasional Santa Fe train passing by. We will supply coffee, cold water, juice, shade, chairs and Portapotties. Local directions, maps and facilities info sent when you register. Please note that motor homes or trailer rigs must park off site. Call 505-861-2287 or email us at adobebuilder@juno.com if you have a special situation. Late May will be warm with cool nights. Dust, insects, heat, mud and cacti do exist, but so will shade and cool drinks which will be on site each day. Gloves, protective footwear, hat, polarized dark glasses and light jacket advised. Students will be asked to sign a release on Saturday morning. 8:00am - 8:20am Coffee and site safety tour.Grab a cup and walk around our immediate teaching area for a quick tour showing you the work stations and pointing out site hazards. 8:20am - 12:30pm lunch Soils and Adobe/CEB Manufacture for the small builder to include Site Prep., Learning about soils and Making Blocks. We’ll be outside for approximately 2 hours with 2 hours inside. Break as you need to. SWSA will have mud mortar ready for Adobe, as well as a drier soil mix for Compressed Earth Block. Assorted “dry” piles of clay, sand and small aggregates will be on hand for blending or amending a mix. You are encouraged to bring some of your own soil if you are driving to class (we’ll test it with a hydraulic press or use it to cast regular adobes). Class will also make small 7” x 2” x 10” adobes used in hornos, domes and vaults. Forms will be ready to make standard and larger adobes, such as the square “corner adobe” (14” x 4” x 14”) and a historical size used for 32” wide walls in Santa Fe in the 1700’s- the 20” x 4” x 10” adobe block. We’ll show you how to make “special” sizes that you might need on your job. Explain about “site prep” to set up your home site for Adobe or CEB and clearances for different adobe materials or services. Some of this material will be sent to you before class to read. Show how to lay out your Foundations/Stems/Floors to code. Determine what a suitable soil mix is for Adobe & Compressed Earth Block and soil types to avoid. Look at different screens to prepare rough soils for block making or mortar. Learn how many cubic yards of material you will need to make the adobes or CEBs and mortar for your home- the 40% plus rule. Understand different methods of forming and casting Adobes. Learn about “inserts” that can change adobe/CEB shapes for different uses, such as channels for electrical circuits or in-wall reinforcements. Learn about tools that cut or shape Adobe or CEB in the field. How to cast holes in Adobes during manufacture. Rudimentary field tests for compression and modulus of rupture for adobe and CEB. Some codes will require a lab report with your plans, showing your block p.s.i. and modulus of rupture. Knowing the field tests can enable you to meet code without too many lab visits (at $75 per test!). 12:30pm - 1:45pm lunch break - brown bag on site or drive to Belén (10 min. drive). 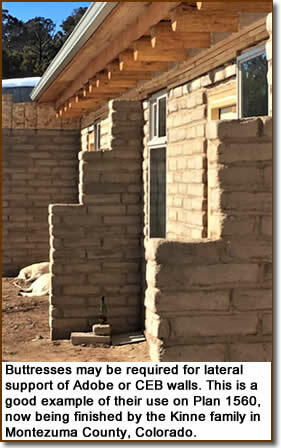 1:45pm - 5:00pm Laying Adobe or CEB to build a wall and learning to make an adobe or CEB arch. Also, Setting Leads, loading the course and tying into a rough buck. The idea this afternoon is to get you into mixing the mortar you’ve learned about, and laying adobes to the string. At the same time, learn to turn corners, build an arch and finish the wall around the arch. Set up Speed Leads and how they are made and work. Set up and plumb speed leads at the stem corners and stretch the line using line blocks. Learn to lay level courses. Understanding your bed joint options before deciding on your course marks (outside). Electrical circuits and/or in-wall reinforcement may play a role, as may the difference twixt CEB and standard adobe. How to lay mortar on the course using different shovels and trowels. Placing Adobes or CEBS on the course. Ways to tie door/window rough bucks to walls. Demo of two popular methods. Types of arches explained and their uses. Arches can save you money and add appeal. Also, If you want to learn to build a vault or dome, the novice starts by learning to build arches. Setting up our arch form on a length of wall. Use of wedges, centering stick and other tools. Building the Roman arch - instructor starts a 36” diameter arch (radius of 18”). Class quickly sees ‘how to’ and will finish the arch. We will pull the form right away to demonstrate how the arch locks upon itself. Learn how to remove the form. Class lays more courses of adobe around the arch, which requires trimming blocks to fit and learning to tool the head and bed joints for appearance. 5:00pm Site clean up - day’s end. 8:00am - 1:00pm Topics: Your home Floor Plan and designing for savings. Using adobe’s mass to your benefit. Regardless of where you’ll build, the old axiom, “Sun and Adobe work together” comes into play. Most have a preferred “style” in mind- such as Santa Fe or Pueblo, Mission Revival, Territorial or Contemporary. Which is the best choice to carry out your ideas? Which is cheaper to build? What kind of wall finish or floor would be most economical or easiest to clean? Which is best for passive solar energy? The main 3 passive solar techniques and where to deploy them. How to determine true south and figure your sun angles. Raul Ortega’s presentation of sun angles using Sketch-up software can help you see where the sun will hit different walls at any time of day or year- just know your latitude and longitude. Where rooms can go for best comfort and effectiveness for energy savings in a solar home. Pros and Cons of the various architectural styles & wall finishes for Adobe and CEB. Figuring the amount of south glazing you will need in your climate zone. What the code says about minimum insulation levels for walls, ceilings and perimeters in your climate zone. Wall systems choices, such as single, double or double with insulated space. 1:00pm - 2:15pm lunch break - brown bag on site or drive to Belén (10 min. drive). 2:15pm - 5:30pm Topics: Looking at the area of stems, baseboards, floors and convenience outlets. Gain some insight into how electrical systems are set up in Adobe and CEB. Go outside and set up some electrical circuits on an adobe wall section. 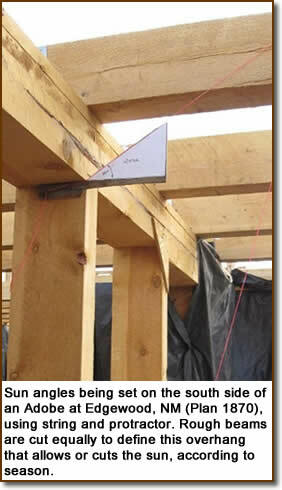 We will use our bond beam on site as an example and show you how to form up a bond beam. Figure required stem heights, finish floor levels, door thresholds, ramps and railings. Explain Floor choices, such as brick on sand, tile or Saltillo tile on slab, flagstone on sand, etched slab and adobe floors. Explain Underfloor radiant systems and Radon prevention. Explain Code requirements for stems and your stem finishing choices. Drawings, slides, show and tell. Set up a few electrical circuits and boxes on one of our adobe walls. Set up pipe (such as Carlon sch. 40), UF cable and show how to set and position a box. Differences between CEB and adobe bed joints require knowing how the wall will be finished (plastered or exposed), thickness of bed joint and whether blocks are channeled. Learn which things not to run together in the same course. Go over bond beam options- what code says. Check out a typical bond beam setup with steel requirement in place. It will be ready to photograph. 5:00pm : Site clean up- day’s end. 8:00am - 10:30am Topics: Stabilization of adobe and CEB. Go over recipes for preparing Portland based and emulsion based stabilizers. Do’s and don’ts. Mix up stabilized batches and cast or press block. Mix up a wheelbarrow of emulsion-based stabilized soil and cast some adobes from it. Show difference in texture and moisture content of stabilized mud mortar from that used to make blocks. Set up a wheelbarrow of Portland-based stabilized soil and cast some adobes from it using hand forms. Also press some adobes from it using the Cinva Ram. Students bringing their own soil can press, amend and press again different soil types, using the Adobe International hydraulic machine towards a better mix. Great chance to talk to one of the regional manufacturers about how these machines work. 12:30pm - 1:45pm lunch break. (brown bag on site or drive to Belén- 10 min. drive). Explain what code requirements are for efficient fireplaces. Not understanding them leads many to abandon their hopes for a real fireplace. Even in the low desert, everyone likes a fireplace and they increase sales appeal (we are willing to do a demo fire in our Rumford on site). Understand the anatomy and you'll quickly recognize which firebox designs perform better. Review all earthen wall types. (single, double, double with air space, double with insulated space). Drafting tips on presenting your chosen wall system to the Plans Examiner at permitting time. Review of attachments between foundations, wall and roof. Understand a historic adobe roof vs. two popular contemporary ones. Handouts of roof cross sections. Talk about parapets, gable ends and hip roofs and their respective costs and seismic resistance. If you are fixated by a certain roof type, how will it fit your climate and pocket book? Explain IEEC and NM energy code requirements- (it's like doing your taxes, but more interesting). 5:00pm Clean-up and end of class. Students load their test blocks into vehicles before departing (bring a few sheets of cardboard for cushions- your blocks will still be green). At least one instructor will stay on site until 6 pm to answer lingering questions. Cost: $359 single or $610 for two registering together. Included materials: Earthbuilders Encyclopedia CD, 50 page hard copy reference, 9 page plan set for a small Solaradobe home* and 40+ loose page handouts or drawings. Most handouts 3-hole punched. *The Plan set will be sent to you electronically two weeks before class. Print out your plans at your local repro shop or give us their email address. We will forward your plan set to them for your pickup. ** Larry Elkins may come on Sunday in which case, we will switch some topics to Monday.